Now we had our new clutch and brake cylinders in place, today was a day for topping up with hydraulic fluid, checking for leaks and bleeding the system. The clutch went fine, with just a small leak from the difficult to reach bracket connection - unfortunately that's the one with the starter motor in the way which means the spanners which are big enough to fit the nut also foul the chassis/starter. Had an unsuccessful go at it today, so I'll have to give it another try next time. Front brakes again went ok as we'd done those after fitting the new lines, but this was the first time we'd done the rear ones and we encountered a couple of gotchas. First off you need the engine on to get a good flow through the bleed screw. The front brakes are close to the reservoir and so get a reasonable pressure straight off, and the clutch is purely pushed via the pedal pumping, but the rear brakes need the servo to get a good flow, so you'll need the engine on. Secondly, leave the drum cover on - don't go getting curious about seeing the brake in action. 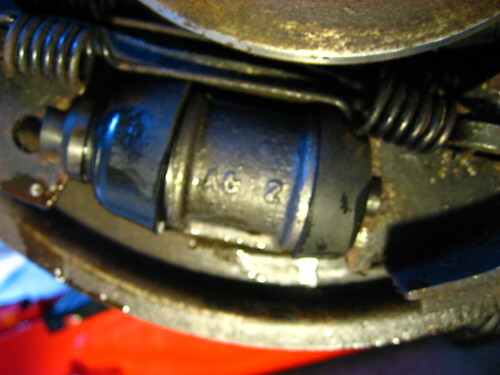 Taking it off and operating the brake pedal results in the pistons in the cylinder extending to their full extent, without the barrier of the cover. You can see that in the photo - the left piston has almost come out of the casing allowing hydraulic fluid to leak out of the join. This should be easily fixed by cleaning up the cylinder and reinserting the piston - and then keeping the cover on while bleeding the brakes!